Millions of American families struggle to pay mortgage payments. 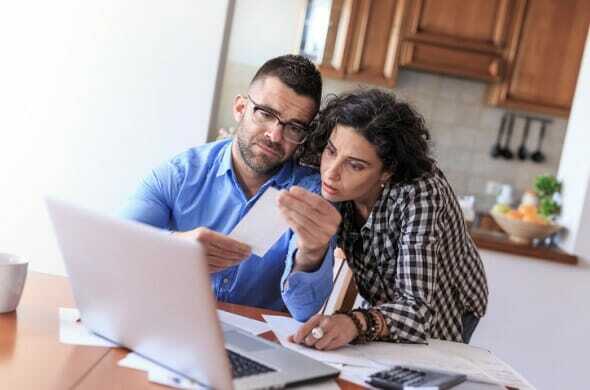 According to U.S. Census Bureau data, nearly 7 million American households were severely housing cost-burdened in 2016, meaning they spent over 50% of their income on housing costs. When households spend so much on housing not only are they less able to afford day-to-day expenses but they are also unable to hit financial milestones, like saving for retirement or investing with a financial advisor. In some cities, housing costs are more burdensome than in others. In order to rank the most and least severely housing cost-burdened households, we compared the number of households spending over 50% of their household income on housing costs and compared it to the total number of households that own their homes. Check out our data and methodology below to see where we got our data and how we put it together. What Does It Mean to Be Housing Cost-Burdened? Housing cost-burdened relates to someone’s total housing costs as a percent of their income. According to the Department of Housing and Urban Development (HUD), you are housing cost-burdened when you spend over 30% of your income on housing. People who spend over 50% of their income on housing are said to be severely housing cost-burdened. Familiarity at the top – There has been little improvement for the cities who ranked in the top 10 in this study the last time we conducted the analysis. 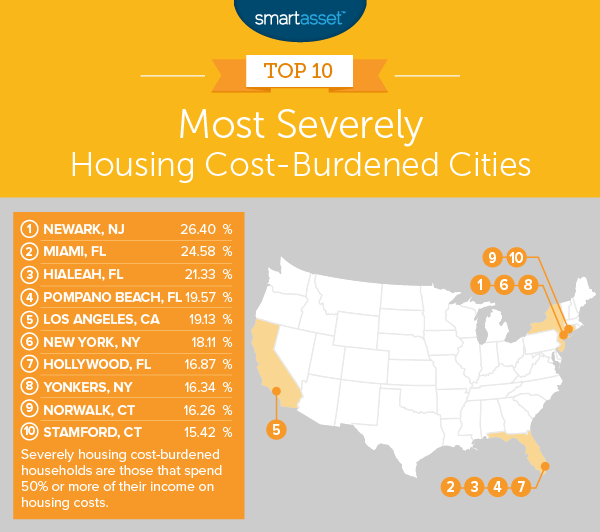 Once again, Newark ranks first and Miami ranks in the top 5 for most severely housing cost-burdened. Florida is the most burdened – According to our data, Florida cities struggle the most with housing costs. Florida has four cities in our top 10. Connecticut and New York meanwhile each have two representatives in the top 10. Over 26% of households pay over 50% of their income on housing costs in Newark, making them severely housing cost-burdened. Our data shows a further 21% of households here spend between 30% – 50% of their income on housing, which fits the Department of Housing and Urban Development’s definition of housing cost-burdened. Altogether nearly 48% of households in Newark spend at least 30% of their income on housing. Miami takes second. The percent of severely housing cost-burdened households increased by 5 points since we last conducted this analysis in 2016. This year, our data reveals that just under a quarter of households pay over 50% of their income on their homes. In particular, the least well-off Miami households struggle the most. Over 61% of households earning less than $10,000 per year are severely housing cost-burdened. Another Florida city takes third. In total we estimate that, based on Census Bureau data, over 21% of households in Hialeah are severely housing cost-burdened. That means more than one in five homeowners are spending the majority of their income just to pay for their homes. Housing cost-burdened households who live in Hialeah can at least take solace in the fact that they live in one of the friendliest states for retiree taxes. Pompano Beach comes in fourth. Just under 20% of households here pay over 50% of their income on housing. Furthermore, just over 16% of households fit the general definition of housing cost-burdened, meaning they spend between 30% and 50% of their income on housing. Combining these two figures, we estimate that over 36% of households are housing-cost burdened. Los Angeles has a high cost of living. Even middle class households in the City of Angels struggle to find homes they can afford. According to our data, just over 19% of all L.A. households are severely housing cost-burdened, and 21.3% of households earning between $50,000 – $74,999 are severely housing cost-burdened. Only households at the top of the income threshold avoid paying large portions of their income on housing. Less than 1% of households who earn at least $150,000 are severely housing cost-burdened here and just over 3% of households who earn between $100,000 – $150,000 are severely housing cost-burdened. New York is famously an expensive place to live. According to our data, many households struggle to avoid paying less than the U.S. Department of Housing and Urban Development recommends. Just over 18% of homeowners here pay over 50% of their income on housing costs, including their mortgage and property taxes. An additional 17% of households pay between 30% and 50% of their income to housing costs, meaning 35.1% of households in the Big Apple are housing cost-burdened. Hollywood, Florida takes seventh. According to Census Bureau data, over two of every five households in Hollywood, Florida spends at least 30% of their income on housing. Additionally just over 16% of households here are severely housing cost-burdened (meaning they spend at least 50% of their income on housing). It could be worse for homeowners here however, at least they are not paying any Florida state income tax. One pattern we see emerging from Yonkers is that property taxes take a toll on households’ housing budget. According to our data, Yonkers is a rare city where households without a mortgage are more likely to be housing cost-burdened than those with a mortgage. In total around 15% of households with a mortgage are severely housing cost-burdened and 19% without a mortgage are severely housing cost-burdened. 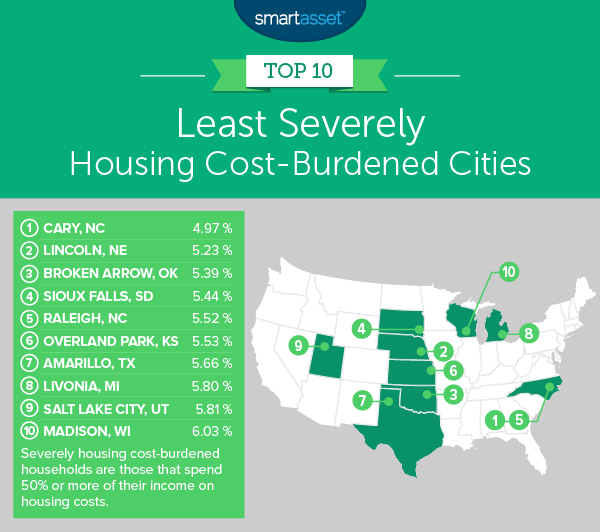 Our final two most severely housing cost-burdened cities are in Connecticut. First up for the Constitution State is Norwalk, located in the southwestern portion of the state. According to Census Bureau estimates, over 16% of households here spend 50% or more of their income on their homes. This means residents here are at risk of both not being able to afford their home in the long run and not being able to save for retirement. Stamford rounds out the list. Over 15% of households here are severely housing cost-burdened and a further 18% spend between 30% and 50% of their income on housing. In fact if we were ranking Stamford for housing cost-burdened households rather than severely housing cost-burdened, Stamford would rank above both Norwalk and Yonkers. Spending over 50% of your income on housing is a rare phenomenon for homeowners in Cary. According to our estimates, only 5% of homeowners here are severely housing cost-burdened. In fact Cary homeowners have done a such good job finding affordable housing that less than 15% of homeowners spend over 30% of their income on housing. With so little money dedicated to housing, Cary residents are some of the most financially flexible in the nation. One of the hardest-working cities is also one of the least severely housing cost-burdened. Our data shows that Lincoln falls right behind Cary. In total, only 5.2% of homeowners here are severely housing cost-burdened. There are some segments of the population who do struggle with housing costs, however. Nearly 70% of residents earning under $10,000 per year spend over 50% of their income on housing, and about 50% of households earning between $10,000 and $19,999 per year spend at least 50% of their income on housing. Broken Arrow has over 30,300 housing units. According to our data, only around 1,600 of them are severely housing cost-burdened. There are also relatively few housing cost-burdened households in this city. According to Census Bureau estimates, only 11% of households spend between 30% and 50% of their income on housing. Combined that’s just over 16% of households in Broken Arrow who spend at least 30% of their income on housing. In previous analyses of severely housing cost-burdened cities, Sioux Falls ranked well. In this version there has been a slight uptick in the prevalence of homeowners spending over 50% of their income on housing but not by much. According to U.S. Census Bureau data, just over 5.4%, or about one in 20, households are severely housing cost-burdened. One factor increasing the housing cost burden on Sioux Falls households is the property tax rate. According to our research South Dakota’s property taxes are relatively high. Only 5.5% of homeowners in Raleigh are severely housing cost-burdened. A further 11% spend between 30% and 50% of their income on housing. In total, that means roughly 16.4% of households here are housing cost-burdened, putting it right in line with Broken Arrow, Oklahoma. Only 16.4% of homes being housing cost-burdened is great news for the city. It should leave residents in the area with savings to plan for their retirement. Overland Park is such a great place to be a homeowner even millennials are buying homes here. With the help of Census Bureau data, we estimate that just over 5.5% of homeowners in Overland Park are severely housing cost-burdened. Conditions are especially good for those earning over $50,000 per year. According to our data, less than 3% of households earning between $50,000 and $74,999 are severely housing cost-burdened. Amarillo, Texas take seventh in this top 10. There is very little separating Amarillo from the cities ranked just above it and just below. Overall, we estimate that 5.66% of households here are severely housing cost-burdened, putting it 0.14% ahead of Livonia, Michigan in eighth and 0.13% below Overland Park, Kansas in sixth. As mentioned Livonia, Michigan squeezed into eighth. Roughly 5.8% of households here are severely housing cost-burdened, while a further 10% spend between 30% and 50% of their income on housing. That means only 16.3% of households here spend over 30% of their income on housing. Long-term homeowners may not get much relief when it comes to paying property taxes. According to our research, Michigan has the ninth-highest property taxes in the country. It is fairly rare to find a severely housing cost-burdened household in Salt Lake City. We estimate that just over 5.8% of households here are severely housing cost-burdened. However a sizable chunk of homes here do push the limit with being housing cost-burdened. An additional 15% of homeowners here spend between 30% and 50% of their income on housing, meaning 21.2% of households spend at least 30% of their income on housing. Our list ends in Madison. Only 6.03% of Mad City homeowners are severely housing cost-burdened. However much like Salt Lake City, a relatively large share of homeowners here are housing cost-burdened. In total, nearly one in five homeowners spend at least 30% of their income on housing. In order to find the most severely housing cost-burdened households, we looked at data for 167 cities. We found the percentage of households which spend at least 50% of their income on housing. We then ranked the city with the highest proportion of severely housing cost-burdened households first and the city with the smallest proportion of severely housing cost-burdened households last. Data comes from the U.S. Census Bureau’s 2016 1-Year American Community Survey. Save early, save often – One of the largest stumbling blocks for homebuyers is finding the capital for a down payment. Previous research we have done has shown that in some U.S. cities, the average household has to save for upward of a decade to have enough for a down payment. If being a homeowner is one of your goals, it pays to start saving as early as possible. You are buying more than just a mortgage – Everyone thinks about their monthly mortgage payment when wondering if they can afford a home. But other costs can add up and be the difference between an affordable home and an unaffordable one. The biggest non-mortgage cost of owning a home is property taxes. Depending on the value of your home and where you live property taxes can add thousands to your annual housing costs. Have a firm number in mind – When you’re looking for a home to buy, try and keep a strict budget for what you can and can’t afford. This will stop you from over bidding on a house you don’t earn enough to afford. Questions about our study? Contact press@smartasset.com.